Egyptian Revolution Enters New Phase as Thousands Brave Violence to Protest Military Rule | Democracy Now! independent journalist and Democracy Now! correspondent based in Cairo, Egypt. His report from Egypt was made possible in part by the Pulitzer Center on Crisis Reporting. AMY GOODMAN: Activists in Egypt are holding their fourth day of massive demonstrations to demand an end to military rule and a transition to civilian government. The protests continue after Egypt’s interim cabinet offered to resign Monday. The offer came as the military continued cracking down on protests that have filled Cairo’s Tahrir Square and other city centers since Friday. Reports from Cairo’s main morgue say at least 33 people have been killed, more than 1,500 have been wounded, in the military government’s crackdown. Some of the dead were reportedly killed by live ammunition fired by Egyptian forces. Protesters have also been attacked with rubber bullets, tear gas and physical abuse. As we broadcast, sources are telling Al Jazeera that the ruling military council has approached Mohamed ElBaradei, the presidential hopeful and former chief of the U.N. nuclear watchdog agency, the International Atomic Energy Agency, to take on the role of prime minister and form a new government following the resignation of the existing cabinet. Meanwhile, a new report from Amnesty International finds Egypt’s military rulers have failed to improve human rights and have instead committed abuses, which in some cases exceed the record of former president Hosni Mubarak. Amnesty International’s Middle East and North Africa acting director, Philip Luther, said in a statement, quote, “By using military courts to try thousands of civilians, cracking down on peaceful protest and expanding the remit of Mubarak’s Emergency Law, the [military council] has continued the tradition of repressive rule which the January 25 demonstrators fought so hard to get rid of.” This turmoil comes as Egypt is scheduled to begin holding parliamentary elections Monday. Democracy Now!’s Sharif Abdel Kouddous has been in Egypt since the revolution erupted in January and has been closely following the latest crisis on the ground. Sharif has been out in Tahrir Square for the last days, joining us now in studio in Cairo. Sharif, welcome back to Democracy Now! Can you talk about what’s happening? SHARIF ABDEL KOUDDOUS: Yes, Amy. What we’re seeing here is really a last stand of the Egyptian revolution. What has happened over these last two days is a new uprising that has taken place 10 months after the revolution began. And it’s happening in the face of a very severe and a very brutal crackdown by the police and the army here in Egypt. This is really—has been brewing for months and months, and ever since protesters left Tahrir Square after the first 18 days on February 11th, the Supreme Council of Armed Forces has been in charge of the country. And what many Egyptians have been seeing over these past 10 months has been that the revolution has been abused and stolen and deformed and that the military council in Egypt has really not lived up to any of its promises in this transitional period, from human rights abuses to just their complete grip on power. And so, what happened on Friday was a very large protest organized by political parties, mainly the Muslim Brotherhood, but that was more to talk about specific issues to do with the constitution and drafting of the constitution and the handing over of power through presidential elections. But what happened after that was a few dozen—a few hundred people spent the night, and on Saturday morning, the Central Security Forces, riot police, came in and stormed the square very, very violently and beat up protesters. And so, what happened and what has happened in the past is that this kind of crackdown, this kind of brutality, will not be tolerated anymore. And so, people came in solidarity to the square. They started clashing with police, and they forced the police out of the square. They captured a police truck and set it on fire. The police responded very brutally with a lot of tear gas, firing the shotgun cartridges that have these rubber pellets in them. And these few hundred protesters managed to hold the square, and the attacks kept coming. And the more the police attacked, the more people would come. What we’re seeing today is tens of thousands of people in the square right now. It’s expected to be hundreds of thousands. What they call a “millioneya,” a million-person march, is expected to start just in about half an hour. But while this is happening in the square, really on the outskirts of Tahrir Square, there’s a war going on. There’s really an urban war that’s happening. And one side has gas and bullets, and the other side has people and will. And the number—the sheer number of casualties is very, very difficult to describe. I don’t think we’re ever going to get an accurate number, because the official state figures are only people who get transferred to the hospital. Tahrir Square has been—is the biggest hospital right now. The center circle—if people are familiar with what the square looks like, the center circle is just a big makeshift hospital right now. It’s a big clinic. There are clinics all around. And what happens is, is that protesters engage with police on these outskirts of the square, the main one called Mohamed Mahmoud, that leads to the headquarters of the Interior Ministry. And they walk up with the almost certain knowledge that they’re going to get hurt. If you go to the front lines enough, you will get hurt. The tear gas is extremely strong, it’s extremely overwhelming. People collapse regularly. You see people spluttering and coming back with red eyes, back from that street, and people just going back in in this constant and surreal exchange. And people are carried out on these motorbikes. People come in on motorbikes two at a time, one driving, one behind. They carry a person who’s collapsed, and the person behind holds him, and they speed him to a makeshift clinic in the center circle or around the square. I can’t begin to describe to you how many people I’ve seen in the past two days. If you just stand, they’ve created kind of these pathways. People create open pathways for the bikes to go back and forth. If you just stand there for 10 minutes, the motorbikes do not stop coming, every few seconds. So, the numbers of injured are into the thousands, well into the thousands. They’re also—and let me just say, this tear gas is extremely strong. Many, many people have told me that this is not normal tear gas. I, myself, have looked at a couple of canisters that said it was CS gas, which is the regular tear gas that’s manufactured by a company in Pennsylvania that’s called Combined Tactical Systems. But there are other types of canisters with no markings at all. So, a lot of people are collapsing from this gas, and a number have died from asphyxiation. What they’re also shooting is shotgun cartridges filled with these rubber pellets. These cause a lot of injuries and a lot of eye injuries. I myself was at the hospital, eye hospital, this morning. I visited a well-known activist called Mostafa, Malek Mostafa, who was shot in the right eye, and he probably will lose that eye. There are at least two other pretty well-known activists who have lost their eyes, one of which lost his other eye on January 28th, and now he’s lost his second eye, so he has been blinded. The police shoot at the front lines. A lot of people duck and turn. But what’s amazing is the sheer courage and bravery of people who keep going up. They throw rocks. There’s the occasional Molotov cocktail thrown. But they go up knowing they’re going to get hurt, and I think they just keep going to let the police and to let the government know that they will not stop coming, that they’re unafraid, and that this is their last stand of the revolution. And so, it’s the police who have to stop. But they haven’t. And this is really becoming a tragedy. I went to the morgue, the state morgue, last night, which is not far from Tahrir. The official there said that they had received 23 bodies between Sunday and Monday, and—I’m sorry, 26 bodies. Twenty-three of them were, he said, dead, killed by live ammunition. Seventeen of them had bullets that exited—entered and exited, which is a clear indication of live ammunition. And the others, he said, had live ammunition bullets still in them. And three of them died from asphyxiation. So, this is—it’s hard to describe what’s going on, but the people are continuing to fill the square more and more. And so, this will not be stopped by violence from the state. So, I’m not sure why they’re continuing to deploy such severe tactics. AMY GOODMAN: Sharif, can you talk about the significance of the entire civilian cabinet offering their resignation, led by Prime Minister Essam Sharaf, and this latest news we’ve heard of Mohamed ElBaradei, the Nobel Peace Prize winner, the former head of the IAEA and presidential candidate in Egypt, being approached to become the interim prime minister? SHARIF ABDEL KOUDDOUS: Well, as you know, Amy, so the Supreme Council took charge on February 11th, and there’s been a cabinet appointed under them, a prime minister, Essam Sharaf, who was favored by many of the protesters after they ousted the first prime minister that they chose, Ahmed Shafik, along with all the ministers, the interior minister, all the ministers in the cabinet. So, they’ve been supposedly the government functioning in the ministries over the past few months. They have absolutely no power in the country whatsoever. The power in the country is the military council. This is clear. They have such little power that most of the time they can’t resign. Essam Sharaf himself, the prime minister, has said he would resign at least twice, and the military council refused his resignation. They do not—they are not the authority here. What this is, what is happening right now—the whole government can resign. It didn’t have any effect in Tahrir. I can say that with complete confidence. This is a stand against the military. This is a stand against the Supreme Council. The chants in the square are against Tantawi, they’re against the military council. This is what this is about. The only way that this is going to stop is for some major decision to be made by the military council either for them to step down or something else, I’m not sure what, to let this go, because the military is in charge of the country. They have killed people. They have tortured people. They have imprisoned 12,000 people by military trials. We’ve seen flare-ups happen, clashes happen, on June 28th, on March 9th, on April 9th. We saw the massacre at Maspero, at the state TV building, on October 9th, where 27 people, mostly Coptic Christians, were killed. This is not what people fought for, and this is not what the revolution was about. And I think what’s happened now is that this has finally spilled over. This has been brewing for so long, and it’s finally spilled over. And it’s manifesting itself right now in Tahrir, the epicenter of the revolution. But it’s not just in Tahrir. It’s in Alexandria. It’s in Suez and several other big cities around the country. 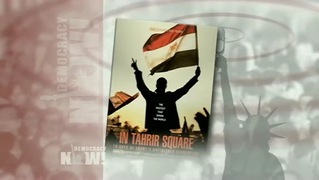 AMY GOODMAN: Who is Tantawi? Explain who Field Marshal Tantawi is and what you expect will happen. Do you think it is conceivable that the military council will step down? SHARIF ABDEL KOUDDOUS: Well, Tantawi is described in a WikiLeaks cable, a U.S. WikiLeaks State Department cable, as Mubarak’s poodle. He is Mubarak’s defense minister. He served as his defense minister for 20 years. The Supreme Council of Armed Forces is a loyal group of generals to the former regime. So, they really are a part of the former regime, and there’s no difference between, many believe, Mubarak and the Supreme Council, that they’re a part of the regime. So he served Mubarak loyally for many, many years. He’s actually—I just heard right before this broadcast started that he’s expected to give an announcement on the air. He doesn’t come on TV very much at all. Other members of the Supreme Council do talk, but he hasn’t been on at all, and he’s expected to make some kind of speech today. I don’t know if the military council will step down. I don’t know what’s coming up in the next few days. It’s very unpredictable. But what I can say is that what’s happening just a few hundred yards from here is an uprising that won’t stop and won’t settle for any kind of small concessions. This has gone too far. I mean, they have really wounded so many people. And like I said, we’re never going to know the real number of wounded, because they’re essentially being treated in the square by the thousands every minute. And so, people aren’t doing this for the interim cabinet to step down or anything like that. It kind of reminds me of when the January 25th revolution started. On January 28th, Mubarak fired the entire cabinet and appointed Omar Suleiman as vice president, as if that would make people stop the revolution. So, I don’t know what’s going to happen, but what I can say is that something new is happening, a new uprising has happened in Tahrir, and it’s going to take something major for it to stop. AMY GOODMAN: The U.S. involvement with the Egyptian military, Sharif—looking at the statement of the White House spokesperson, Jay Carney, he said, “We call for restraint on all sides, so that Egyptians can move forward together to forge a strong and united Egypt.” A call for restraint on all sides. Wasn’t that response before Mubarak fell, with the first Tahrir uprising? SHARIF ABDEL KOUDDOUS: Yeah, we’ve heard that before. I mean, that’s the U.S. government’s standard language when talking to a government that they’re allied with. And they certainly are allied with this government, the military. They fund them to the tune of $1.3 billion a year. The tear gas—and this is not lost on the protesters, they know this—comes from Pennsylvania. A lot of them come up to me and ask me to read the labeling, where it says “Made in Pennsylvania” and says the name of the company. And this language of restraint on both sides, there’s no question there were clashes in the beginning. Protesters throw rocks at police. Like I said, there’s Molotov cocktails once in a while. But there is no question about who are the victims, who is getting hurt here; who is using the overwhelming amount of violence against the other side, and that is the police. And we saw—there’s really shocking videos, as well, of—on Saturday, they tried to—I’m sorry, the days are a bit fuzzy because I’ve been in the square constantly. But on Saturday, they tried to clear the square, and they fired a lot of tear gas and came in, and on one side, the police, on the other side, the army. And they were beating people, and a few people fell, got shot or fell down. And there’s videos of police and army, military police, dragging bodies. They’re lifeless. We don’t know—well, we don’t know if they’re dead or alive, but they’re certainly unconscious—dragging them over into a pile in the trash and just walking around, not giving them any medical care. There’s videos of them dragging a woman by her hair across the street, beating elderly people. I’ve seen many children severely wounded. So, to call for restraint on both sides is really quite ridiculous. And so—go ahead. AMY GOODMAN: Sharif, the parliamentary elections on Monday, what is their significance in light of this mass protest, the million man march that’s called for today? SHARIF ABDEL KOUDDOUS: Well, the elections have been—we’ve been waiting for them to come. And right now, I don’t see how the elections can take place while this is happening. The elections have been so complicated and messy and controlled by the military council. They recently—they’ve been trying to control the process, control the outcome, control the drafting of the constitution, where, right now, the parliament that’s elected, under the current proposed guidelines by the Supreme Council, really doesn’t have much power. The Supreme Council is supposed to pick 80 out of 100 people who are supposed to—the constituent assembly that’s supposed write the constitution. So the parliament only picks 20. The Supreme Council is supposed to appoint the prime minister and the cabinet. The parliament doesn’t do that. So, it’s unclear what this parliament is really going to be mandated to do. And this is, I mean, I think, far bigger than the elections, what’s happening right now. I can’t imagine that—maybe they’ll take place in a few days. I can’t see how a legitimate election can take place when you have such state-sponsored brutality happening in the heart of the capital city of the country. And we’ve seen political parties posturing and talking about what’s happening these last few days. The Muslim Brotherhood, they have—that’s the movement. Their party is called the Freedom and Justice Party. They have said they’re not taking part. They released a statement saying they’re not taking part in the million man march today, because they stand to gain—presumably, they stand to gain from the elections. They’re a very organized political force, and they’re expected to do very well and gain a large number of seats in the parliament. And so, instead of really focusing on what many see as the real problem, which is the military council, they’re focusing on their own interests. A lot of liberal groups, political parties, have made compromises with the military council in these last 10 months to—in fear of the Muslim Brotherhood and the rise of the Islamists and somehow taking over the country and creating an Islamist state or taking away the civil—a civil state. And so, they made compromises with the military, as well. So you have this kind of this politics going on, and what’s forgotten is why people went into the street in the first place. The calls were bread, freedom and social justice, human dignity. And people feel that this has not been achieved, and so they say, “El sawra mostamera,” the revolution continues. AMY GOODMAN: Sharif, I want to thank you for being with us. Please be careful today as you go out, continuing to cover the protests, as he has been all through the weekend. Again, the latest news, 33 people, at least, are dead, and 1,500, at least, are wounded. As Sharif has been reporting, Tahrir is the largest hospital in the world. And just looking at a Guardian article, it says the tear gas used by Interior Ministry troops in Cairo’s Tahrir Square is supplied by the U.S. company. Demonstrators say cartridges retrieved from the scene are branded with the name and address of Combined Systems Inc., or CSI. The firm is located in Jamestown, Pennsylvania. It specializes in supplying what it calls “crowd control devices” to armies and homeland security agencies around the world. It also manufactures lethal military equipment.